Is it just me, or does that Basilisk looks like it is trying to get in the shot? Congrats, Autumn on reaching Archmage. Want to hear my 2 cents on pet talents? 1. Appreciation or lack there of. In order to get the feeling of obtaining a wonderful pet you get the appearance factor, then comes the talents. You may not get everything that you want but there's a chance somebody has what you want. 2. That brings us to the next important factor--Interaction. To guarantee that people mingle with other people KI designs pets to be, well, in a way of saying not too perfect. This feature, you might say is down right mean. Yes, it is. It is also a good sure-fire way for all wizards to keep trying and try they will to attain that perfect pet every wizard wants to have and show off to all their friends. 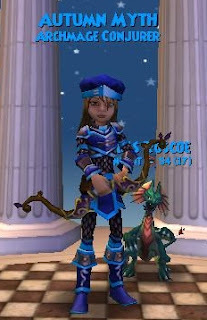 While doing so, KI has ensured sustainability in the game, and possibly continuing interest in the life of Wizard101. Ya, I know. I sound like an employee. I wish I was in some ways. I play this game way, way, too much.